This title is directed primarily towards health care professionals outside of the United States. 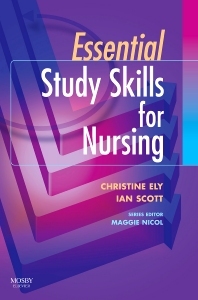 Study skills are essential to nursing and this easy-to-use guide will helps to develop the skills necessary to academic and professional life. This book takes a friendly approach and is written in a straightforward style. Using examples from the real experience of being a student nurse or midwife it covers vital areas such as self-motivation, why attention to detail is important, numeracy skills and how to make the most from the help available at universities and colleges. In addition it shows ways to: manage and plan your time effectively; get the most out of lectures and seminars; read effectively; remember more; make notes and use them to develop understanding; manage and succeed at assignments; develop practical nursing skills; learn from clinical experiences; and develop reflective skills. How to become a successful student nurse. How to manage your time and study effectively. Learning resources. How to find information. Writing and presenting. How to pass assessments. How to learn practical nursing skills. How to learn from experience: becoming a reflective practitioner. How to have confidence with numbers. Glossary. References.